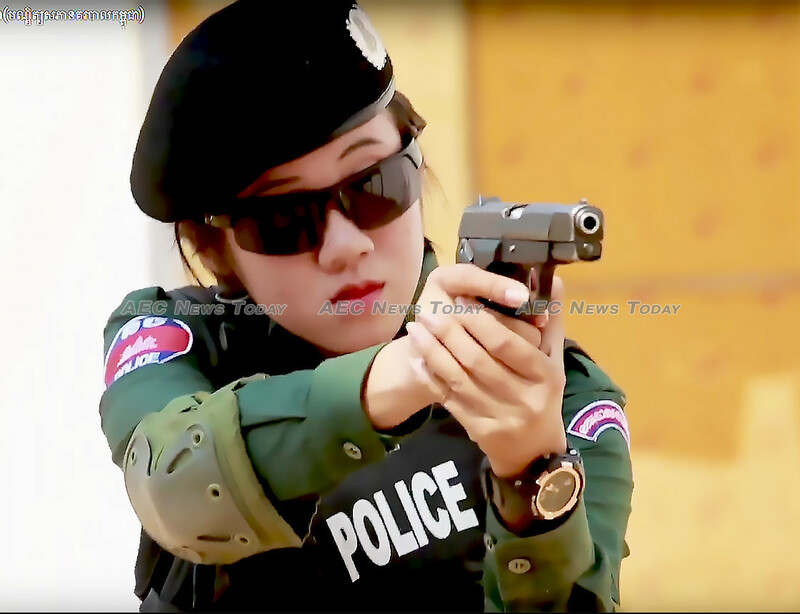 A recent government information video showing young officer-cadets being drilled in everything from jungle combat to dance is providing a visually stunning insight into the ideals behind Cambodia’s police training regimen. The Police Academy of Cambodia (PAC) released the highly produced video, which runs to almost 12 minutes, to demonstrate how it is implementing a government plan to upgrade the Cambodian National Police (CNP). Hundreds of young, fit cadet officers — both male and female — perform physical training and other tasks with skill and precision. The video also shows classes where recruits learn state laws, computer skills, and art — not to mention dance lessons. A narrator explains that in addition to professional and physical training, sports and arts are necessary to preserve good health and Khmer culture. According to the spiel, the training is aimed at inculcating principles of equity and non-partiality in the cadets, as well as the four values of quality, professionalism, discipline, and excellence. Under Prime Minister Hun Sen, the government has expressed an aim to reform and improve all sectors, including police and prison officers. To achieve this policy, deputy prime minister and Interior Minister Sar Kheng, has begun developing human resources by providing both tangible and emotional support to National Police officers, with the stated aim of improving their ethical and professional skills by bolstering their education. The measures come after recent incidents involving Cambodian National Police highlighted a need for improvement. In January this year a National Police officer was arrested after he was allegedly caught on CCTV footage assaulting a member of the traffic police who had stopped him for running a red light. In early May, Mr Sar revealed that more than 3,000 members of the Cambodian National Police force were illiterate, leading to calls for recruits to meet minimum educational standards. In June, on Cambodian Veterans Day during a ceremony chaired by Prime Minister Hun, three Cambodia National Police officers were caught on camera, sleeping. Five officers — including one who took the photographs and one who shared them on social media — were suspended as a result. In addition to training future Cambodia National Police, prison officers, and other security personnel in public order, law enforcement, and allied skills such as foreign languages, the PAC is also tasked with conducting scientific research.